ID4Africa 2017 will be held on 26-28 April 2017 at the Safari Court Hotel and Conference Centre in Windhoek, Namibia. The venue is located at the Corner of Auas & Aviation Streets, Windhoek, Namibia and is a 30-40 minute drive from Windhoek’s Hosea Kutako International Airport. The conference will be held in the Namibia Conference Room and the Exhibition will be held in the Grand Ballroom. For this event, ID4Africa has arranged specially discounted rates with select hotels for all delegates attending ID4Africa 2017. Please note that March 2017 onwards is peak tourism season in Namibia and room bookings will be highly subject to availability. We advise all delegates to arrange hotel accommodation at least 1 and a half months prior to the date of event in order to secure your room. ID4Africa will provide bus transfers from the Hilton Windhoek and Windhoek Country Club & Resort to the venue during the morning of each day of the event (26 to 28 April). The 5-star Windhoek Country Club & Resort (under the Legacy Hotel Group) is located just 5 minutes by car to the venue. 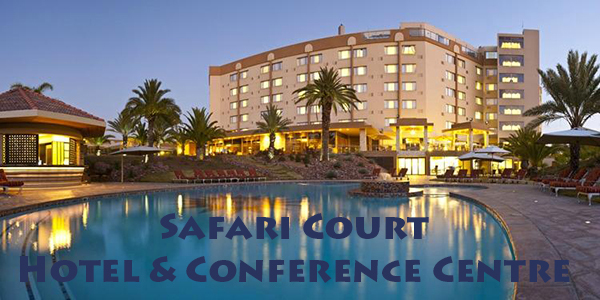 The hotel provides shuttle buses which operate frequently to and from the Safari Court Hotel and Conference Centre. ID4Africa will also arrange bus transfers from the hotel to the venue during the event period (26-28 April). ID4Africa has arranged the special rate of USD195 per night for the Deluxe standard room, inclusive of breakfast and internet access. This special rate will be available until February 28, 2017, after which rooms will be subject to different rates and availability. Full room charges will be made in the case of NO-SHOWS or for notifications of cancellations made less than 7 days prior to the expected day of arrival. The 5-star Hilton Windhoek is located in the heart of the town and is about 12 mins by car to the event venue. ID4Africa has arranged an exceptionally low rate of USD135 per night for Deluxe standard room occupancy, inclusive of breakfast and internet access. To enjoy this special rate, please contact Julia Li in the ID4Africa office at j.li@id4africa.com. *Please note, this booking form will not be available online. Please contact the ID4Africa office to receive your copy. We can arrange airport transfers for N$ 350.00 single person travelling and N$ 200.00 per person one way from Windhoek International Airport to Hilton and vice versa. Please advise your hotel confirmation, flight arrival time and flight number to arrange the transfers accordingly. The transfers will be billable upon checkout. Please refer to the hotel booking form (download here) to find out more about the options and rates available. Your completed booking form should be returned to the hotel at reservations@safarihotelsnamibia.com or reservations3@safarihotelsnamibia.com and copied to Julia Li in the ID4Africa office at j.li@id4africa.com. This special rate will be available until March 11, 2017, after which rooms will be subject to different rates and availability.